For an in-depth understanding of how snow and ice can damage trees and the likely impacts on long term survival, download this exceptional guide from the University of Illinois, Trees and Ice Storms. Young, recently planted trees that have fallen over can usually be saved. Cover any exposed roots as soon as possible to protect them from drying out or freezing. Detailed instructions for saving these trees are covered in this Louisiana Extension fact sheet. Mature trees and trees with trunks over 10-12” in diameter that fall should be removed. In addition, trees that partially uproot and have over 1/3 of their roots exposed are typically beyond help and should be removed. Learn more about caring from fallen trees from this Florida Extension website. Most shrubs damaged by snow and ice can be severely pruned if necessary. Wax myrtles are particularly prone to breaking when weighed down by snow and ice but can be cut back to within a few feet of ground level and will regrow, usually within one or two seasons. Most broadleaf evergreen shrubs (camellias, azaleas, hollies) and deciduous shrubs (spiraea, butterfly bush, Knockout rose) can be treated this way, but conifers (thuja, juniper, cedars, arborvitae) cannot. Conifers that break apart in ice storms will not recover and should be removed. Keep in mind spring blooming shrubs cut back now will not bloom this year. For more pruning tips, see this recent Extension Gardener post. 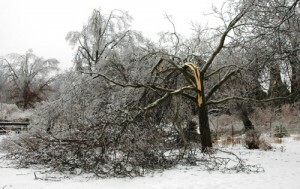 Some trees are weak wooded and more likely to be damaged in wind, snow and ice. Weak wooded trees commonly planted in North Carolina include: Leyland cypress, lacebark elm, Bradford pear, water oak, silver maple, green ash, willow and pecan. To minimize future damage, avoid planting these trees near structures. Learn more about what makes some trees more prone to ice damage from this New Hampshire Extension fact sheet. Anytime you have a tree removed, replace it with a stronger wooded species. Trees more resistant to wind and ice damage for central NC include: crape myrtle, bald cypress, hickory, ironwood, ginkgo, and white oak. More tips on dealing with storm damaged trees are available on NC State Extension’s Gardening Portal. Learn how to prepare your landscape for snow and ice from this Extension Gardener post. Thanks to Guy Meilleur, ISA Board Certified Master Arborist for reviewing this page and making suggestions for its improvement. • Does Mistletoe Harm Trees? • Why Is It Important to Prune Fruit Trees Every Year?